RediSem Ltd. Science Park Shatin Hong Kong Tel. +852 2607 4141 Fax. 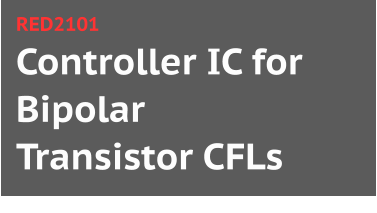 +852 2607 4140 Careers | Contact © Copyright 2014-2017 RediSem Ltd.
RED2101 is a controller IC intended for bi-polar long-life Compact Fluorescent Lamps (CFL) with power up to 25W with TO92 transistors.